Chinese Christians are playing a leading role in protests that have seen tens of thousands of people shut down the streets of Hong Kong. Protestors are angered by Beijing’s decision to control the list of candidates for the island city’s top leader in its first free election, slated for 2017. Churches are also playing a role, supporting the protests with food and shelter. 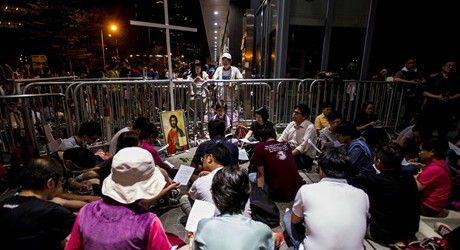 Though several of Hong Kong’s major churches have publicly taken a neutral stance, others are providing first aid, snacks, or refuge to protestors. Christian symbols are highly visible, as demonstrators form prayer groups, carry crosses, and openly read their Bibles. Christian churches have been sprouting in Hong Kong since the British took control in 1841. About 43 percent of the island’s 7.2 million people claim a religion—about 320,000 of them are Protestant Christians.